Armiger Christopher Chambers was born and raised in St. Johnsbury Vermont. An early interest in computers resulted in his first job as a computer programmer while still in middle school. As a Computer Science undergraduate he spent two semesters as a research assistant at Argonne National Laboratory working for the Condensed Matter Theory department. This research led to his first scientific publication, an article on Neural Networks published in Physical Review A. During his early 20s the armiger’s other main interest was martial arts, and he earned black belts in Karate and Jiu-Jitsu. After finishing his B.S. in Computer Science he moved to Burlington Vermont to attend graduate school with a Graduate Teaching Fellowship at the University of Vermont. After leaving UVM he worked for a number of small technology startup companies in the greater Burlington area. During this period he joined MENSA and became an active member in the local groups, including editor of the newsletter. In 2002 he and his two business partners sold all of their company’s intellectual property to a publicly traded consumer electronics firm headquartered in Southern California. As part of the acquisition, the armiger moved to Irvine California and accepted the position of Director of Home Connectivity. Currently he is the Executive Director of Software Architecture and manages software teams and developers in the US, India, and the Ukraine. He has several scientific publications and is the inventor or co-inventor of roughly two-dozen patents. In recent years the armiger has devoted more of his time and effort to charitable and other philanthropic efforts. He was awarded the President’s Call To Service Award in 2012. In 2013 he was created a Chevalier in the Imperial Order of the Star of Ethiopia. Later that year he was commissioned as a Kentucky Colonel and honorary Aid-De-Camp on the Governor’s staff, the highest civilian honor bestowed by the Commonwealth of Kentucky. He is the Lord of the Manor of Skighaugh in Essex England, and a member of the Manorial Society of Great Britain. 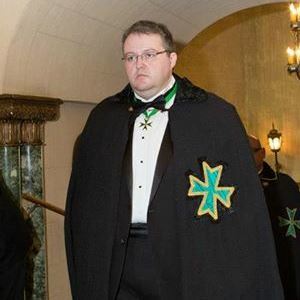 He joined the Hospitaller Order of St. Lazarus of Jerusalem in 2011 and is currently the Chancellor of the Grand Priory of the United States.